This wedding was different from the ones we did and also from the ones to come! It was the first marriage on which we didn't follow the bride and groom before the ceremony, during the preparations, but it was also the first wedding we did the "first look". For those unaware of what the "first look" is, it is very common in the United States, for example, where the bride and groom choose an intimate and private place to see each other for the first time, on wedding dresses, before the ceremony! And here the traditions seem to bump! If on the one hand on the other side of the ocean they see the "first look" as a way of the grooms saying goodbye while unmarried and also allows them to take a moment just before the "i do" to support and reassure each other on the step that they are about to take, in our culture it is believed that if the groom sees the wedding dress before the ceremony it will bring misfortune and bad luck to the couple! What is our position? We do not believe that it can bring any kind of bad luck, especially with the wonderful couples we have known and have had the opportunity to photograph! After that we were thrilled by the originality and difference that we have been presented with, in the end it is good to innovate and break traditions are not a reason for us to think that the end of the world is near! The fact that they've seen each other before the ceremony provided a greater tranquility to D. and G. and made them hold hands and enter together on the place where they would say "i do"! If we find truly beautiful the image of a bride entering the church on the arm of her father, we don't think that it is less handsome the image of the grooms coming together, supporting and comforting each other, which only makes us believe even more that they are entering together in a new life, that they are truly together and taking the right step on the way of the "i do"! This wedding had so many adventures and details! That made part and are the story of the day! We were very well received at the Hotel Monte Real and also felt a lot of receptivity from the friends and family of the couple, who they chose to witness and share one of the best moments of their life together! It is a privilege to photograph and document, to witness and record a so pure, so simple and yet so noble feeling! 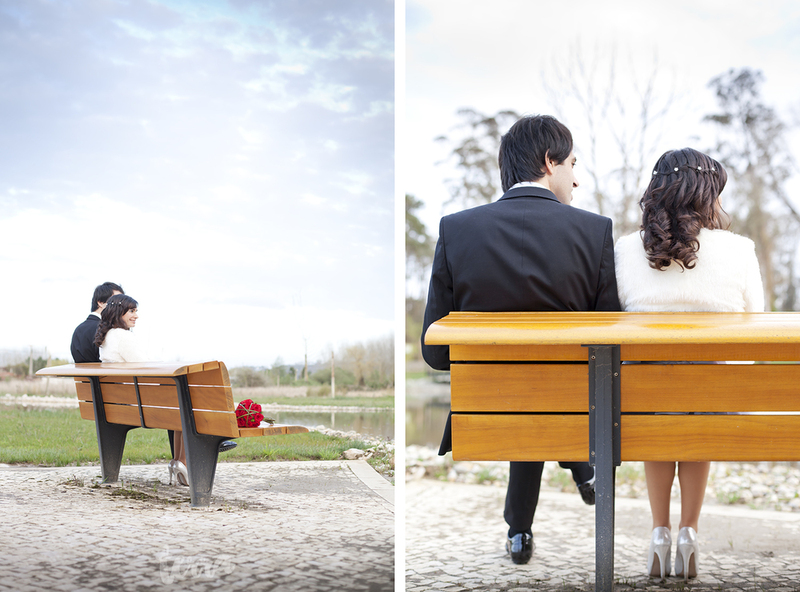 Thanks to Diana and Gonçalo for chosing us to your special day, we wish you all the best in this new life! And here are some photos and memories of the day!